Frustrated by the weeds and invasive species preventing his family from enjoying the lake, he tried pulling them by hand instead of depending on chemicals or mechanical harvesters. The results were longer-lasting and more complete, and as his family’s property became the envy of the bay, word spread! Over the years, Waterfront Restoration has expanded its services and service area while keeping abreast of the latest invasive species concerns and best practices. Today, over 500 regular clients rely on Waterfront Restoration to clear and maintain their lakefront properties. Waterfront Restoration possesses the highest certifications in the lake weed removal industry. We hold all commercial mechanical control permits, as well as invasive species permits for transporting, decontaminating, and servicing any property or equipment infested with aquatic invasive species. Additionally, all employees hold active licenses as certified lake service providers through the Minnesota Department of Natural Resources. We use nets and rakes to remove all the weeds from the surface of the lake. Since floating weeds can return quickly, we offer this service on-call, weekly, or biweekly, depending on your needs. Did you know that the average lakefront has four broken bottles, three rusty cans, and two sharp fallen branches lurking beneath the surface? 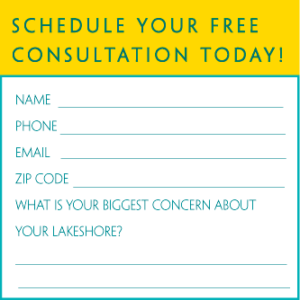 Let us scour the bottom of the lake for garbage, rocks, and debris that are dangerous (and ugly) so you can fully and safely enjoy your new, weed-free lakeshore. Invasive zebra mussels can attach to any hard surface—including docks, boats, and rocks—causing damage and clogging irrigation pipes. Their razor-sharp shells also make swimming and wading hazardous. We completely remove these invaders by prying them from underwater surfaces and disposing of them safely off-site. DNR-certified inspectors will check for invasive species and decontaminate watercraft before they head out on the lake.